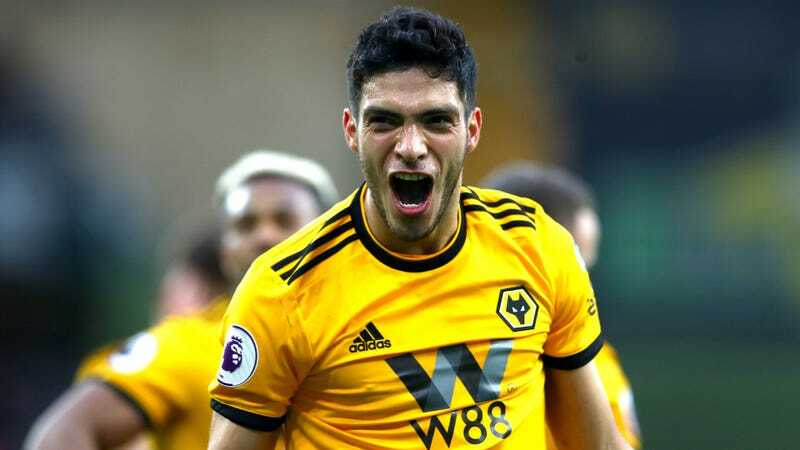 Yesterday, Premier League club Wolverhampton made Raúl Jiménez the most expensive Mexican player ever by paying a reported transfer fee of £30 million to make the on-loan striker’s move to the West Midlands permanent. The signing is a savvy one from Wolves’ perspective, as they get a proven goalscorer who has this season emerged as one of the league’s best players outside of the top six clubs. But it’s an even better move for Jiménez himself, who at long last has found a club that believes in him. This is the 27-year-old Jiménez’s third big transfer of his career. His first came nearly five years ago, when Atlético Madrid took note of the young forward tearing apart defenses in Liga MX with Club América and snatched him up for €11 million. The union appeared ideal. Atleti, under the ferocious leadership of manager Diego Simeone, had thrived in recent years off the backs of large, powerful, aggressive, relentless strikers who served as the attacking brass knuckles between the fingers of the defense’s tightly clenched fist. Radamel Falcao had solidified his stardom under Simeone and left for the riches of Monaco in 2013. Diego Costa had done the same and left for Chelsea in 2014. Jiménez, by temperament and playing style, was all set to become the next of that lineage when he arrived in Madrid. Unfortunately, it was not to be. While Jiménez did make 21 appearances in La Liga during his first season in Spain, only four of those were starts. The Mexican found playing time hard to come by behind Antoine Griezmann, Mario Mandžukić, Raúl García, and midseason loanee Fernando Torres. Jiménez scored just one goal all season. After only a single year in the Spanish capital, the club placed him on the transfer block. Even though his time in La Liga wasn’t the best, Jiménez still had plenty of promise and, therefore, value, to clubs across Europe. Hence why Atlético were able to sell him to Benfica for €22 million (it was a weird, two-part transfer, the specifics of which are not worth getting into here), which was then the highest fee a club in the Portuguese league had ever paid for a player and the most a Mexican had ever fetched. As the record signing of a great team in a very good yet clearly second-tier league, it was a solid bet that Benfica would give Jiménez every opportunity to prove his worth, and that sooner or later Jiménez would reward that faith and become the kind player he’d always had the potential to be. Once again, it was not to be. The story in Portugal was similar to the one in Spain. Jiménez was a regular in Benfica’s matchday squads in his three seasons there, but he never could make the transition from late-game attacking substitute to full-fledged starter. Jiménez made 80 league appearances for Benfica, but only 20 came with him the starting lineup. In spite of the lack of playing time, Jiménez was remarkably effective in his super-sub role. In those 80 matches, the striker managed to thump in 18 goals and, arguably even more impressively, lay off 11 assists. This gave him a per-90-minute strike rate of a little more than a goal every other game. When you add in his assists, his goal contribution numbers were at almost exactly one goal either scored or assisted every 90 minutes—great stats for a rotation player. With his strength, his hard-charging off-ball movement, his soft feet, and his poacher’s instincts, Jiménez was lethal when set loose against tired defenses vulnerable to his energy and finishing skills. Jiménez might not have been playing as much as he’d like, but he was certainly getting better. All he needed was a team to let him show the full extent of his growth. His move to Wolves this past summer was perfect to this end. Benfica let Jiménez join the Wanderers on loan with an option to buy, and Jiménez immediately became the club’s undisputed starter. After biding his time for years in search of a place to show what he could do as a protagonist, the 27-year-old veteran had finally found a club willing to make him their main man up top. Jiménez has wasted no time paying Wolves back for their faith. Jiménez has played in every one of Wolves’ 32 Premier League matches so far this season, and has been the starter in 30 of those. His performances more than validate his playing time. Jiménez is one of the most tenacious back-to-goal hold-up strikers in the league. That strength and quickness and determination of his that allows him to fight off center backs for possession of long passes before using his deft touch to slide a pass out to a teammate is the lifeblood that makes Wolves attacking game work. His constant runs in behind warp opposing defenses’ structure and open up the space all over the field for his team’s creators like Diogo Jota and João Moutinho to slip into and construct Wolves’ offense. He is a terror in the box as an almost exclusively one- or two-touch finisher who gets his chances on goal with canny movement into the slivers of space between defenders and quick, powerful strikes as soon as the ball comes under his control. And when he finds the ball at his feet without an open shooting lane presenting itself, he’s great at staying patient, sizing up the field, and flipping the ball over to a better positioned teammate who can then kick the thing at the goal. All of those skills, coupled with all of that playing time, have made for a exceptionally productive season. Jiménez has amassed 12 goals and seven assists in that time; both respective figures top the team’s scoring and assisting charts. In the entire Premier League, Jiménez’s 10 non-penalty goals are tied for the 12th most, and the only name in front of his on that list who doesn’t play for one of the Big Six is Everton’s Richarlison. His seven assists are the joint eighth-most in the league; only Ryan Fraser (10) has more for a non-Big Six outfit. Jiménez’s numbers are even more impressive in the context of his team as a whole. His 19 combined goals and assists account for 48 percent of the entire Wolves team’s scoring output. That’s the largest percentage in the Premier League. Those goals are a key reason why Wolves are one of the stories of the season. Though this is the club’s first season back in the top flight, Wolves are pretty solidly the best team outside the Big Six. Nobody looks forward to competing against these guys. Between the league and the FA Cup, Wolves have beaten or drawn with Man City, Tottenham, Man Utd, and Chelsea. Liverpool are the only Big Six team to escape Wolves’ wrath so far this season, and the Pool Boys host the Wanderers in the final, potentially title-deciding match of the EPL season. As impressive as it’s been, Wolves’ ascent is no surprise. Unlike the typical mid-sized club in a blessed season during which it flirts with the table’s upper-third spots, Wolves did not get here by signing relatively cheap, undervalued players and developing them. Instead, Wolves are run like a big club in miniature. Their success is due to their willingness to throw (what is for them) large sums of money around to acquire good players. Because Wolves are Wolves and not Man City, the upper limits on their spending are far below that of the big boys, as is the talent they’re able to attract. Nevertheless, Wolves do have enough cash and luster to sign very good players at the level just below the elite, and Jiménez’s transfer is the best example of what this strategy looks like when it works. Jiménez is far from a perfect player. He can score and he can assist, but he can only really do so when set up for it by other players. He doesn’t have the ability to create chances by himself, nor does he participate in the game much beyond holding up the ball at the start of attacks and applying the finishing touch at the end of them. For these reasons, Jiménez probably won’t ever be coveted by a Champions League aspirant, unless it is in the confining super-sub role he found liberation from by coming to England. Far from being a criticism, all of this is great news for both Jiménez and Wolves. In Wolves, Jiménez has a fantastic club willing and able to make him their star and build the perfect team around him in which he can exhibit his brilliant, specific talents. In Jiménez, Wolves have a phenomenal striker good enough to get them where they want to go—which is presumably to consolidate their place as the best of the rest while hoping to capitalize on a slip or two from the Big Six to possibly sneak into a Europa League or Champions League spot one day—yet not quite so good that they have to worry about him taking off for a bigger team in the near future. It’s taken Wolves and Jiménez a long time to get where they belong. For Wolves, that place is back in the Premier League, with a team that might not be one of the league’s best, but can compete with the best in any given week. For Jiménez, it’s at a club willing to give him the minutes and teammates he needs to be his best, fullest self. In each other, Wolves and Jiménez have found their perfect compliments, both at a similar level and able to help one another realize their shared aspirations. With yesterday’s transfer making their partnership a permanent one, they’ve both ensured that their already successful journey won’t stop here.